Star Sapphire Linux (Oz Unity remix). Centered wallpaper, Unity launcher hidden and replaced with Cairo Dock using Compass icons. 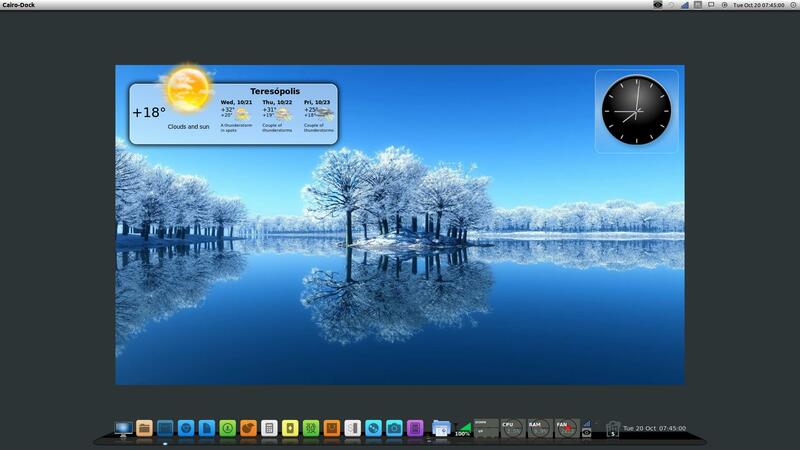 Also showing clock widget duplicated on desktop and GIS Weather. (1) Does this mean that this particular wall paper can be used with Ubuntu, instead of the standard Unity desk top that comes with Ubuntu? (2) Can the wallpaper at #139 of this thread (Solus OS Final), be used with any Distro? Absolutely. There is always a default selection of wallpapers included with the base distro install or you can choose to use a single color, graduated color and an image from whichever folder you choose. I have a collection of wallpapers that I copy across to whichever distro I happen to have installed at the time. The only issue is some of them are not suitable for my HD widescreen monitor but if there is something specific that falls into this category you can often re-download it in a more appropriate resolution. Just about ANY picture can be used. You may need to adjust or crop to fit. I use various pictures that I have taken myself, depending on the environment I'm in. 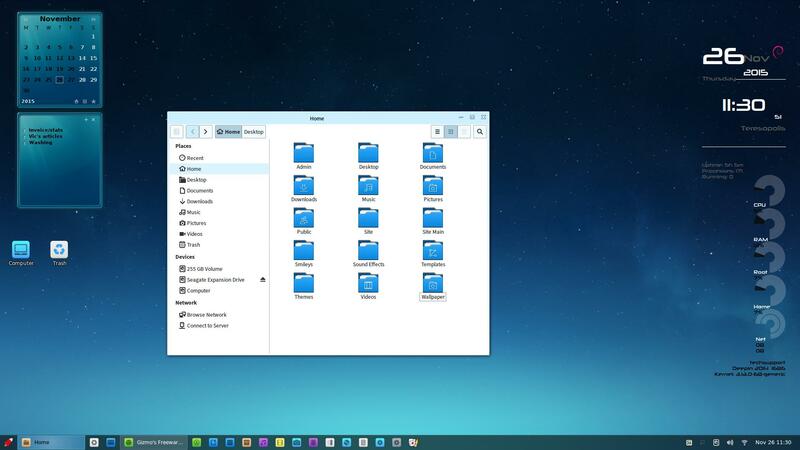 Linux Deepin featuring Rainlendar, Conky and using Dolphin as alternative file manager. Some things blacked out for privacy purposes. This looks amazing! Can you please tell me how you got this display of such detailed information about CPU, Network, Battery etc.? If my desktop looked like this I'd need stress counselling just to log on. They're windows gadgets from addgadgets.com . Of course, if you're using Windows 8 or newer, it will be a little more difficult than simply downloading and installing them. They also have a GPU meter, as well as stock, weather, earthquake, and a whole bunch of other meters. I've also reduced the refresh interval to 10 seconds, that way the gadgets take up less CPU and the graphs shows information about system performance for about the last 15 minutes.